"A portable solution to protect your USB drives"
Removable USB drives, including the popular USB stick and pendrive are known as highly targeted by viruses, mainly because the are an easy victim and plugged into multiple computers, a thankful distribution solution for the malware. Now, it’s not that difficult to protect your USB drive against malware infection, but it requires some computer skills. As such, you might be interested in an easy solution to protect your USB devices. Well, here we present you USB WriteProtector. It’s a freeware utility that will do the trick for you in no time. What’s interesting about USB WriteProtector is the fact it doesn't require any installation to be performed, hence it can be considered portable and you could include it on your USB drives. 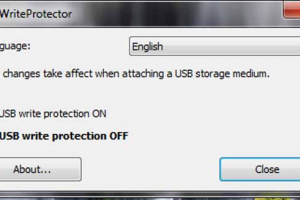 This means you can easily enable and disable write protection for your USB drives anywhere and anytime according to your needs.